Interesting change and addition in Facebook Home!! According to the Facebook newsroom, four hot new photo sharing sites added to Facebook. The new additions in Facebook Home are Flickr, Instagram, Tumblr and Pinterest. Today, it was announced by Facebook, that this feature will begin testing within "Facebook for Android Beta" version. There was a new update related to Android's Facebook Messenger app this month. So two new updates for Android users. When you wake up in the morning and swipe Facebook Home app, with that now you will get these four apps to swipe through and get along. Now swiping through photos from Facebook Home app with Flickr, Instagram , Tumblr and Pinterest. To get this facility, you need to update both "Facebook for Android" and "Facebook Home for Android". 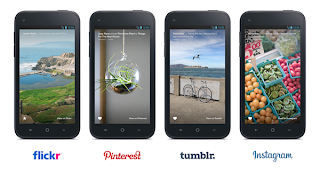 So now with Facebook Home app, get the latest photos from four added sites.